Prepare vegetables first. Peel, rinse, and shred carrot. Peel, rinse and press garlic. Rinse and slice red pepper. Peel, wash and cut an onion into small pieces for sauce and shred onion for the meatballs. I like to soak the meat in water for an hour or two changing the water a couple of time. Then cut the meat in pieces and soak it again for an hour or so washing and changing the water every 15 minutes. Add 4 cups of water into a saucepan. Bring it to a boil. Reduce heat to med/low and then add buckwheat to the boiling water. Let it boil for 15 min, stir from time to time. Remove from the heat and pour the water with buckwheat into a strainer. Rinse well under cold running water. Let the water drain from buckwheat and then transfer into a plate cover with a lid and set aside until ready. Add 2 tbsp. of olive oil onto a sauté pan and then add onions. Sauté onions on med/high heat for 5 minutes, or until golden brown on the edges. Add shredded carrots and pressed garlic and sauté it for 5 more minutes. Then add tomato sauce and sauté for 5-7 minutes mixing constantly; paste needs to be incorporated with the vegetables. Place sautéed vegetables into a medium saucepan. Add red pepper water, heavy cream, salt, ground black pepper and better than bullion into the saucepan with sautéed vegetables. Stir it all together and set aside. Preheat the oven to 350 F. Wash the meat pies and place it into a strainer for the water to drain and then grind the meat on the meat grinder. Place ground meat, buckwheat, eggs, salt, and pepper into a medium bowl. Mix it together until well combined. Add mayonnaise and mix it well again. Then add shredded onion and mix it all together once more until all well incorporated. Scoop meat mixture with an ice-cream scoop and shape them into a ball by rolling the meat with your hands. Coat a large sauté pan with olive oil and bring to a med/high heat. Brown the meatball on both sides. Place them all into a large pot. 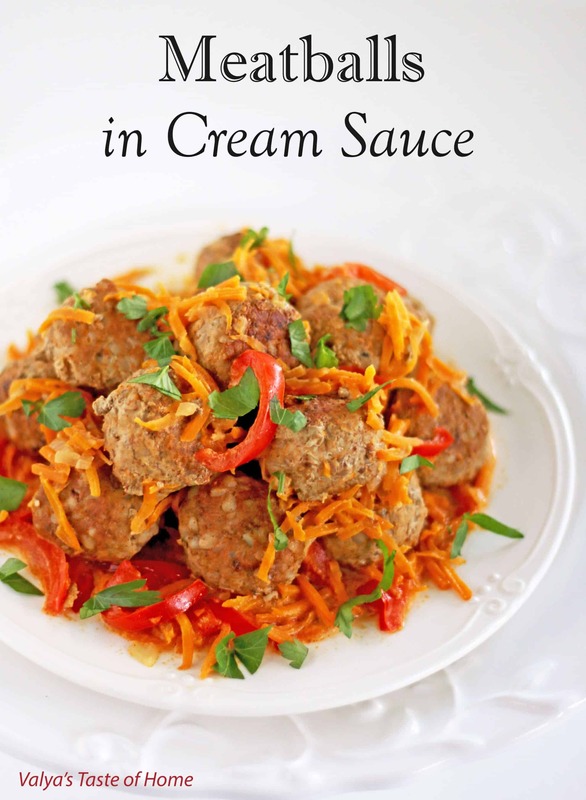 Place the cream sauce onto a stove top and bring it to a boil, stirring constantly. Pour the sauce over the meatballs. Cover the pot with a lid, place it into the oven, and cook it for 1 hour at 350 F. After it’s done cooking, remove it from the oven and serve hot over mashed potatoes, rice, pasta or buckwheat.